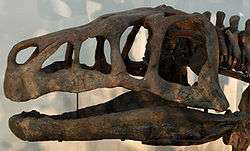 Skull of Shansisuchus shansisuchus at the Paleozoological Museum of China. Erythrosuchidae (meaning "red crocodiles") are a family of large basal archosauriform carnivores that lived from the later Early Triassic (Olenekian) to the early Middle Triassic (Anisian). They were the apex predators of their day, with lengths of 2.5 to over 5 meters. Their fossil remains are known to date from South Africa (Beaufort Group of the Karoo Basin), China, and European Russia, from the Early to Middle Triassic. Erythrosuchids were unusually large and robust archosauromorphs. Several features set them apart from other archosauriformes and are also seen in later, more derived archosaurs. For example, they lack teeth on the palate, which are found in other early archosauriformes such as Doswellia and euparkeriids. In erythrosuchids, the centra (central parts of vertebrae) are deeply indented on either side, differing considerably from the usual cylindrical shape of the centra in early archosauriformes, but similar to later archosaurs. The heads of erythrosuchids are generally large and deep. One distinguishing feature of erythrosuchids is the shape of the margin of their upper jaw. In all erythrosuchids, the lower margin of the premaxilla, the bone at the tip of the upper jaw, is lower than the lower margin of the maxilla, the bone behind the premaxilla. This forms a characteristic "step" which makes erythrosuchids easily distinguishable from all other early archosauriformes, which have smooth jaw margins that are either straight or gradually curved. Erythrosuchids are notable for being the first archosauriforms to have a triradiate pelvic girdle with three projecting areas formed from three bones: an illium and an elongated pubis and ischium. Although it is small, the fourth trochanter, a ridge on the femur that serves as a muscle attachment in archosaurs, first appears in erythrosuchids. The triradiate pelvis and fourth trochanter are both features which indicate that erythrosuchids had an erect stance similar to later archosaurs. More basal archosauriforms such as proterosuchids lacked these features and probably had a more sprawling posture. Erythrosuchids were formerly classified as thecodonts of the suborder Proterosuchia. This classification is no longer used by paleontologists, who now employ a cladistic approach. In this, erythrosuchids constitute an Archosauriformes clade that is an outgroup to the Archosauria proper. The presence of certain archosaurian features such as the triradiate pelvic girdle, the fourth trochanter, and the third metatarsal longer than the fourth, indicate that erythrosuchids are closer to the true archosaurs than the Proterosuchidae, which lack these features. Thus the Erythrosuchidae occupy a transitional evolutionary position between the most primitive archisauriformes and more advanced Triassic archosaurs. Below is a cladogram from Ezcurra (2016), that reexamined all historical members of the "Proterosuchia" (a polyphyletic historical group including proterosuchids and erythrosuchids). The placement of fragmentary taxa that had to be removed to increase tree resolution are indicated by dashed lines (in the most derived position that they can be confidently assigned to). Taxa that are nomina dubia are indicated by the note "dubium". Bold terminal taxa are collapsed. Ezcurra (2016) recovered a monophyletic Erythrosuchidae, although the relationship of the Long Reef form (SAM P41754) and Uralosaurus remain unknown within the family. 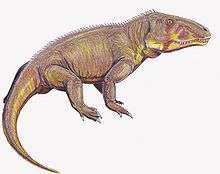 The large contemporary kannemeyeriid dicynodonts doubtless constituted much of erythrosuchids' prey. However, the first erythrosuchids appear in the fossil record slightly earlier than the kannemeyeriids do, so it must be assumed that they also fed on other animals as well. 1 2 3 Parrish, J.M. (1992). "Phylogeny of the Erythrosuchidae". Journal of Vertebrate Paleontology. 12 (1): 93–102. doi:10.1080/02724634.1992.10011434. ↑ "Erythrosuchidae". Palaeos. Retrieved 1 July 2010. Wikimedia Commons has media related to Erythrosuchidae.